When the Chicago Bears signed free agent QB Mike Glennon to a big-money deal this offseason, many felt that the Bears were content to run with Glennon as their quarterback for now and address the need in a later draft. So it came as a surprise when the Bears traded up in the draft to pick Trubisky with the second-overall selection. While the Bears have said that Glennon will be the starter this year, Trubisky’s preseason play has impressed enough that many are calling for him to start immediately. Trubisky has the 10th-highest adjusted completion percentage so far this preseason at 82.2 percent and has an impressive 130.0 passer rating on throws where he’s not under pressure. Trubisky was one of the top quarterbacks in all of college football last season, and the Bears obviously liked him enough to trade up to get him. He was very accurate last season, posting an adjusted completion percentage of 74.7 percent that ranked 17th in the nation. He was also one of the most accurate under pressure, finishing his final college season with a ninth-best 66.3 percent adjusted completion percentage on plays under pressure. While the Bears are going to play Glennon early on in the season, it seems likely that Trubisky will eventually see time for the Bears. Especially if Glennon struggles. Trubisky is the Bears quarterback of the future, so expect them to ease him into things. But once he’s there, the success of this Bears offense will depend on Trubisky. Despite allowing one of the lowest passer ratings against in college football last season at 41.3, Tabor found himself falling to the second round where he was scooped up by the Lions. 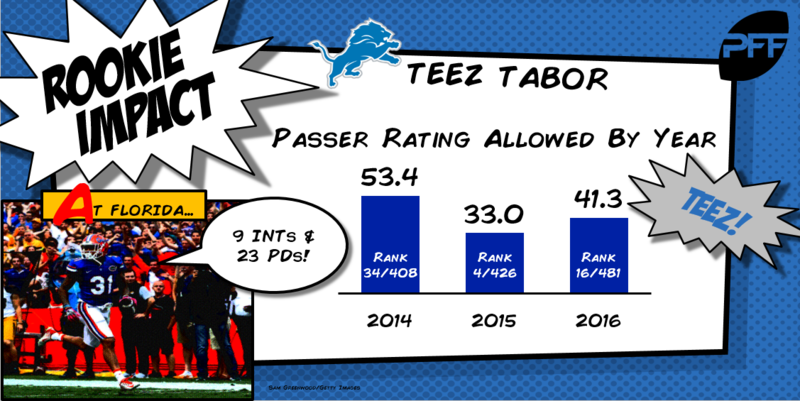 The Lions currently have a top corner in Darius Slay, but the depth behind him is lacking which is where Tabor can make an impact. Last season, Tabor averaged 16.4 coverage snaps per reception allowed, which ranked 22nd in the NCAA among corners that saw at least 40 targets. He allowed just 0.84 yards per coverage snap, and finished the year with four interceptions and six pass defenses compared to just one touchdown allowed. So far this preseason, Tabor has played at a similar level to what was seen from him in college. He’s averaging 10.3 coverage snaps per reception allowed and a near-identical 0.80 yards per coverage snap. What the Lions have to be most impressed with is that when Tabor does allow a reception, he’s keeping everything in front of him. Tabor has surrendered just five yards after the catch on four receptions and has not missed a tackle yet. He’s also made two solo run stops for the Lions defense. While Tabor may not start the season, he should work his way into playing time as the year progresses. By this time next year, Tabor could very well be starting across from Slay, giving the Lions a very formidable one-two punch at corner. For anyone who watched a Packers game last season, it should come as no surprise that corner was a position that they needed to address this offseason. That’s why they drafted Washington CB Kevin King with their first pick in the draft at the start of the second round. King shined for a fantastic Washington secondary, and finished the year with an 84.0 coverage grade that ranked 40th in the NCAA among all corners. King saw a fair bit of targets in college with teams attempting to avoid teammate Sidney Jones as often as they could. But he was still impressive despite those many targets. King averaged a target every 6.8 coverage snaps, but allowed a reception once every 13.7 coverage snaps. But what’s possibly most impressive is King’s ability to not allow the big play. Over the last three seasons at Washington, King allowed just eight completions out of 38 deep targets (passes travelling 20 or more yards in the air). None of those went for touchdowns either. In fact, King allowed just two touchdowns over the past three years at Washington, including zero last season. While King struggled in his first preseason game, allowing seven receptions on eight targets for 90 yards and a touchdown, he’s settled down over the past two games. He’s combined to allow just four catches on seven targets for 36 yards and one pass defense, although he did miss three tackles last game. The Packers are banking on King developing into a top corner for them and while it likely won’t happen this season, look for King to get some valuable experience this year to help him develop for the seasons to come. Despite being our No. 9 overall prospect in the draft, RB Dalvin Cook fell all the way to the Vikings early in the second round. Based on his college play, the Vikings got a steal and a player that they hope can mitigate the loss of former star RB Adrian Peterson. Cook was phenomenal last year in college, forcing a nation-leading 98 missed tackles and gaining 1208 yards after contact which was also first in the NCAA. His elusive rating of 128.1 was first among any running back with at least 200 touches last year. Cook is also very capable of the big play, as he rattled off 26 runs of at least 15 yards last season. He also averaged a respectable 1.53 yards per route run, which ranked 29th in the NCAA. Cook proved to be a three-down star running back in college and he’ll look to be the same for the Vikings. This is an offense that needs a running back that can create big plays despite poor blocking, much like Cook did at Florida State. Cook has been solid so far this preseason, averaging 4.1 yards per rush with 2.9 of those coming after contact. 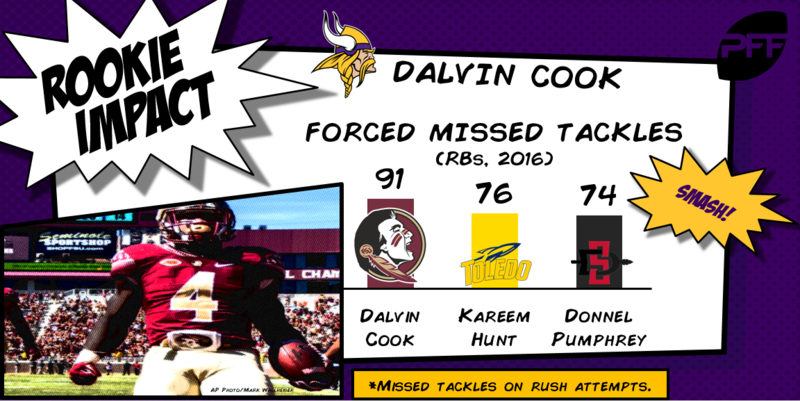 Cook will likely get a majority of the carries for the Vikings this season and should have a big start to what the Vikings hope will be a long career as a high-level runningback for them.